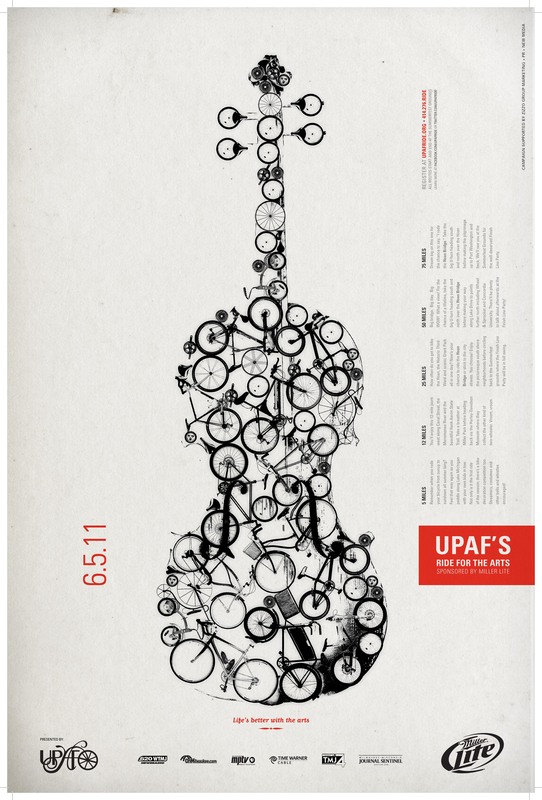 The upcoming weekend is bicycle overload, and I must say the posters for all the events are super cool. Here are a few of the highlights if you are looking for something to do. Everything kicks off Friday at 5:30 pm at the Cafe Hollander on Downer. 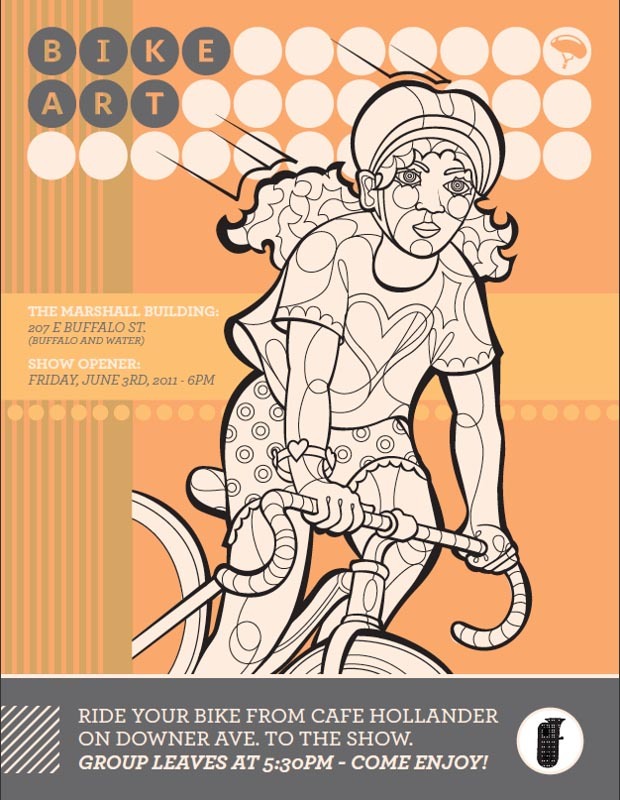 Meet me there where I will lead a conversationally paced social ride to an art opening in the Marshall Building, 207 E Buffalo Street, that features bicycles as the objet d’ art. If you are sick of riding with me, show up at Water and Buffalo around 6pm. I promise not to make a speech. My buddy Steve is co-producing/curating the show. He has spent the last couple months hunting down scads of bicycles of all fashions and functions, from funky folders to cool cruisers and minty fresh vintage racers. This will be the place to geek out about bikes. Drool cups will be provided at the door. If you are a fixie afficianado, the art show puts you dangerously close to the Swinging Door Saloon, home to Milwaukee’s first messenger service and the start of the First Friday Alley Cat. Those start at 7pm and have a $5 entry fee, winner take all. More info about the underground race series..
Get up early Saturday morning, pop an ibuprofin or two and and pedal over to the Washington Heights Bike Blitz in the Park , which begins at 9am by the bandshell in Washington Park. Sponsored by Milwaukee Bicycle Works, this is an event in which volunteers do free basic repairs on neighborhood people’s bikes as well as sell lightly used bicycles on the cheap. I will be there wrenching alongside other mechanically inclined residents who live nearby Washington Park as well as guys from the Velo Trocadero Team and Wheel and Sprocket. If you missed the sale at the Boys and Girls Club, this is another shot at a cheap commuter bike. There will also be lots of kids bikes for sale. We shut it all down at noon so there is still time to rummage at the Washington Heights neighborhood rummage sale. We can always use more help, so if you are good with a wrench, stop in for a bit to pump some tires, oil some chains and tweak some brakes. I’m trying to twist the arms of my skater pals J&J to pedal down with me for at least the first few stops. While there is no rule about it, I encourage people to wear costumes to this ride. If you get arrested, it makes that mug shot so much more memorable. Depending on the temperatures, I may not wear a true costume. What I have in mind I consider an outfit, but others may argue I have crossed the line. Come on down a bit before 6pm and find me at Burnhearts at the intersection of Potter and Logan and you can be the judge. I can’t stay up too late Saturday at the TdF because I don’t want to over sleep and be late to the start line for the Miller Lite Ride for the Arts. This year the grand charity ride goes over the most forbidden fruit of bike routes in Milwaukee: the Daniel Webster Hoan Memorial Bridge. My daughter and I will be biking down from the West Side around 7am to be at the start line by 8am. Given the 7 mile ride down and back and my daughter’s preference for equines over bicycles, we probably won’t do the whole 25 miles we signed up for. Let me know via comments below if you want to join us. And if you enjoy your trip over the elusive bridge, please show your support for a permanent route by emailing or calling your elected officials and liking the Hoan Facebook page. It is not too late to register for the ride if you have been procrastinating. Thank you. As obvious these may seem for those embedded in bicycle culture, they are easily overlooked by those who are not. Several times each summer, I think, “Man, I wish I had known about that,” after reading a post-event review or report somewhere. Hopefully a few of the more casual will now be able to support the people who make this stuff happen. Nice post and nice posters. It’s to promote a benefit bike race on the Milwaukee Mile for the PabLove Foundation. Thanks! I missed this one. Just goes to show there is too much bike stuff for one weekend. My son will be riding the third wheel behind the Raleigh as we cross over the Hoan on Sunday. Let’s look for each other at registration Dave. I’m working over a few of the neighbors to see if we can’t form a posse. Friday sounds like a lot of fun too. Bikes on display and Too Much Rock in one night. Definitely going to try to work this one in. Yeah, MySpace is sooo 2009. Actually, I thought the MySpace page had all the same information on it and seemed about as up to date as the harder to find Facebook page, but I switched the link to join 2011. Those are some neat looking posters. I’ve always wondered what the story was behind the hohum BTWW posters. This years poster seems to be the worst in recent memory. I know a year or two ago they had an artist paint the poster which was quite nice, but for whatever reason they didn’t repeat that theme. Anyways, I think BTWW does get people to try biking to work. I know two guys at my work are going to give it a shot. They are giving it a try w/o my prompting or pestering. BTWW must be the little push that people sometimes need. I set them up with some maps and I’m going to show them a good route. Hey Mark, I do plan on writing a bit about BTWW for Monday’s post. I will comment about the posters in that piece. I do agree with you that BTWW does indeed get people out trying their commute on bike for the first time. See you around the salt mines.